Marsh Landing is the premier gated community in Northeast Coastal Florida, ideally located in Ponte Vedra Beach on a barrier island, just 18 minutes south of Jacksonville. Ponte Vedra Beach is located in St. Johns County, the fourth wealthiest county in the state. Once inside the gates of Marsh Landing, you will discover the natural beauty of the pristine Northeastern Atlantic coast of Florida (often referred to as “The First Coast”) and the best of North Florida living. Our community of more than 1,000 homes encompasses an 18 hole Ed Seay/Palmer design championship golf course, 10 Har-Tru tennis courts, two parks, beautiful marshes and ponds, access to the Intracoastal Waterway (ICW) and an active community with many clubs for diverse interests. Our active Homeowners Association has always maintained a balanced budget with long range planning. Our hometown - Ponte Vedra Beach - is composed of miles of white sandy ocean beaches where sunbathing, surfing, fishing and boogie boarding are enjoyed. Beautiful nature preserves with kayak and walking tours are nearby. First rate public schools, world class golf and tennis, nearby shopping centers, live music, theater and concerts and many local and upscale dining options add to the story. Ponte Vedra Beach is the home of the PGA Tour and the annual Players Championship (remember the island green on 17!) and headquarters of the ATP World Tour for tennis professionals. For the fisherman, there are the nationally recognized annual Kingfish Shootout and Wahoo Shootout Tournaments. We also present several surfing contests each year. Of course we can’t forget to mention the world-renowned MAYO Clinic located less than five miles from our gates, and our home team NFL Jaguars. St. Johns County is the highest ranked county in Florida for fiscal responsibility with a budget surplus for the past three years and has not had to resort to using any reserves to achieve a balanced budget. Of the 67 counties in Florida, St. Johns County has been one of the most accomplished in job creation in Florida, especially in professional and business services, leisure and hospitality, trade, transportation and utilities. If you are considering relocating to NE Florida, you owe it to yourself to visit Marsh Landing. 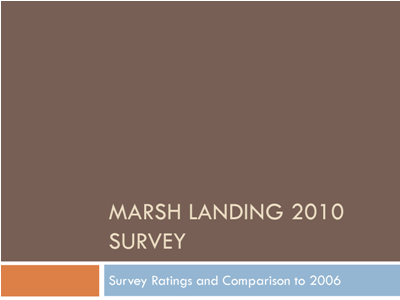 What do residents say about life in Marsh Landing? See our Documents Page for our governing documents and information about our Homeowners Association. Joining the Country Club is optional for residents of Marsh Landing. A variety of membership levels are available. Visit the Marsh Landing Country Club website for more information.